Because photographers differ about their preferred choices of focal length for a particular genre, we’ve adopted a slightly different format this time. While we’ve kept the zooms and primes apart, instead of presenting the best lenses by focal length, we’ve arranged them into three groups according to use to help you narrow down the best performers by focal length in each of the three categories. We tested 13 wide and ultra-wide zoom models with focal lengths from 11 to 35mm on the Canon EOS 5D Mk IV, with DxOMark scores ranging from 16 points for the original Sigma 12-24mm F4.5-5.6 to a high of 32 points for the Art series Sigma 24-35mm F2 DG HSM A. This new high-speed model straddles both wide and standard zoom categories, so we’ve elected to compare it later, concentrating here instead on models with a wider angle of view and thus more appeal to landscape photographers. 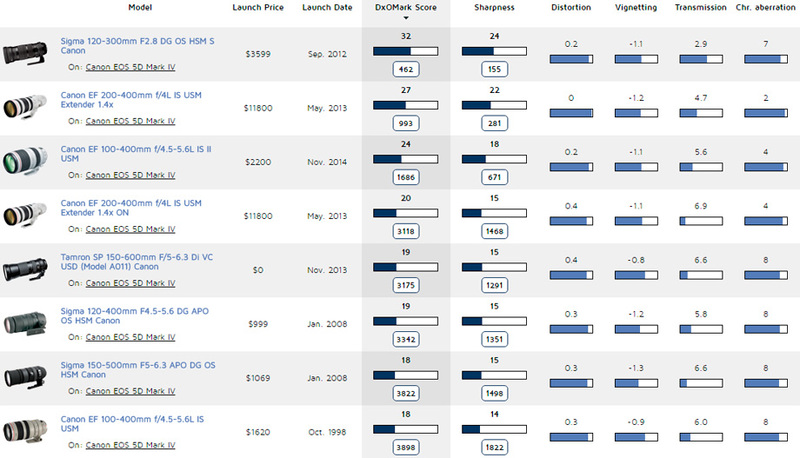 As with the prime lenses, the models in this category offer quite a range of focal lengths. 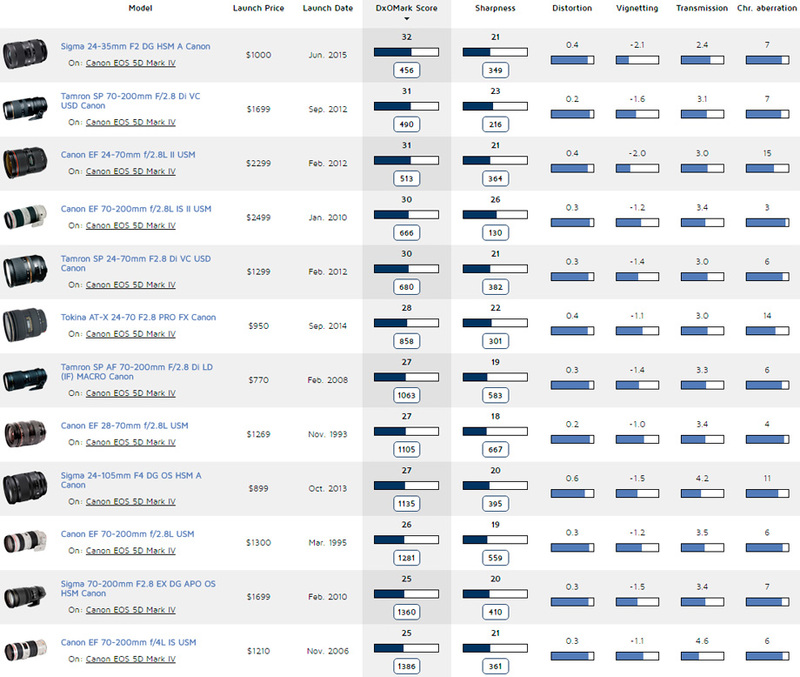 In first place with a DxOMark score of 29 points is the stabilized $1,199 Tamron SP15-30 mm F2.8 Di VC USD. It has a useful range and good sharpness levels at either end of the zoom range, but with some astigmatism noticeable at mid-range, its sharpness isn’t as uniform across the field as it could be. 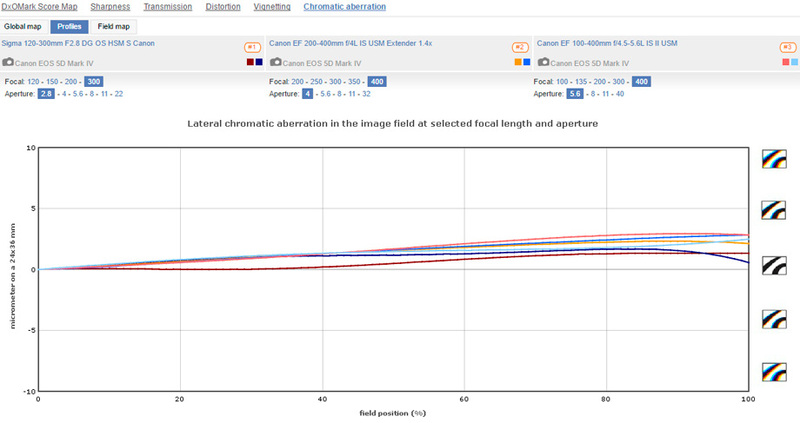 It also has slightly higher distortion than the Canon or Tokina. Although the second-place Canon EF 11-24mm F4L USM costs $3000, it’s a remarkable lens. It is the widest rectilinear model available for full-frame cameras, and yet it has very low distortion, excellent sharpness across the field at all focal lengths, and — particularly given the angle of view, pretty good control of chromatic aberration. The f/4 maximum aperture won’t worry landscape or architectural photographers, as this lens (like other ultra-wide models) is meant to be used on a tripod. In third place is the competitively-priced $849 Tokina AT-X 16-28 F2.8 Pro FX. It doesn’t have the same uniform sharpness of the newer models at wider apertures, but it has excellent sharpness across the frame when stopped down, as well as low distortion and chromatic aberration. 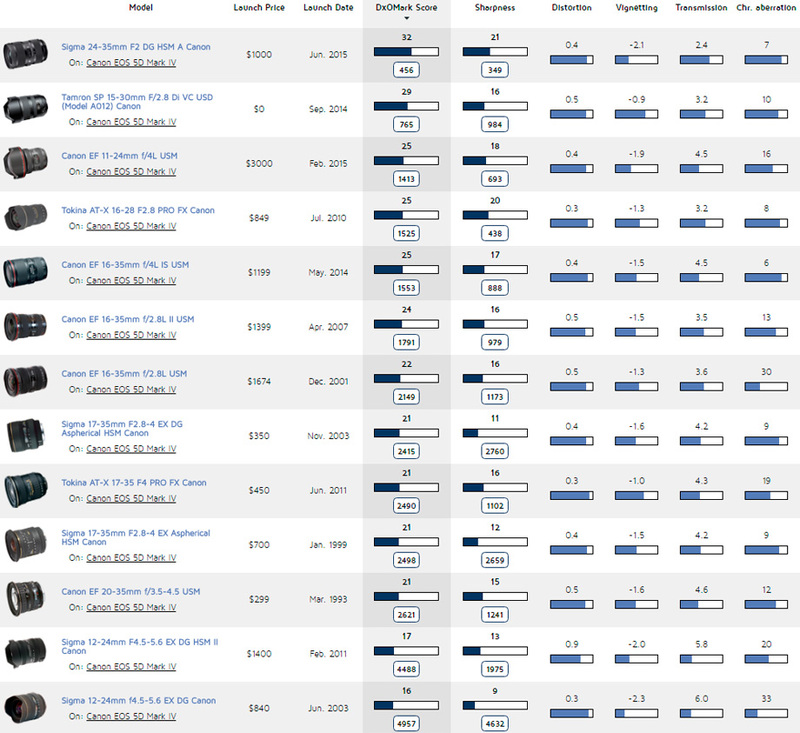 As the selection spans several categories for one genre, we tested a total of 25 lenses, though we show the performance results for only the top 12 models in the table below. This time we’ve included the Sigma 24-35mm F2 DG HSM A, which achieved a high of 32 points; but models such as the new Canon EF 24-70mm F4L IS USM and the original EF 24-105mm F4L IS USM narrowly miss being included among the top 12, with lower DxOMark scores of 23 and 22 points, respectively. 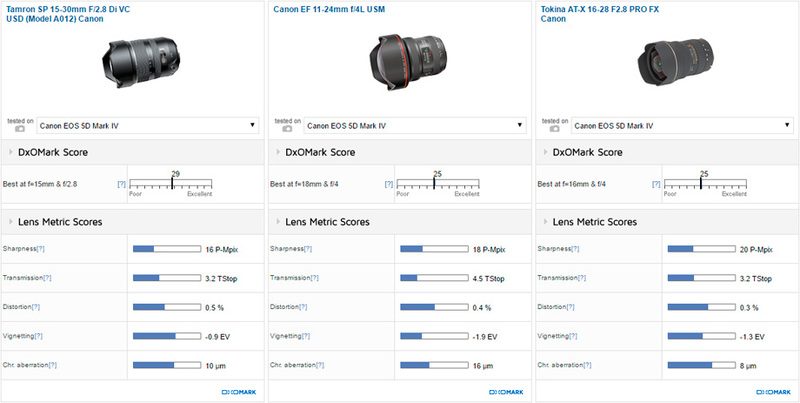 With a relatively narrow zoom range, it’s not really surprising to see the Sigma 24-35mm F2 DG HSM A at the head of this list until you consider the high-speed F2 maximum aperture. Like other Art-series lenses, it has very high sharpness and low chromatic aberration; however, like most zooms covering this focal range, it has some barrel distortion and vignetting. The three top-performing models represent very different propositions, but the focal range of the Sigma is a little restrictive, unless you intend to use the lens to portray people in their surroundings. 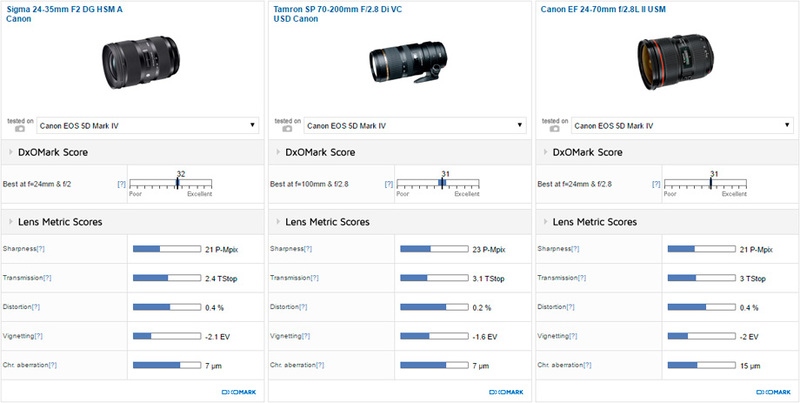 In second place with a DxOMark score of 31 points, then, is the Tamron SP 70-200mmm F2.8L Di VC USD. This new model has high sharpness levels with excellent uniformity throughout the focal range. It also boasts lower-than-average distortion and excellent transmission. 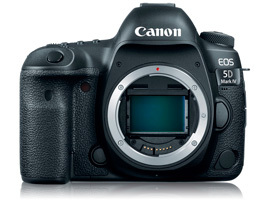 At $1699, it’s significantly cheaper than the Canon equivalent, but has better correction of lateral chromatic aberration and higher peak sharpness levels. 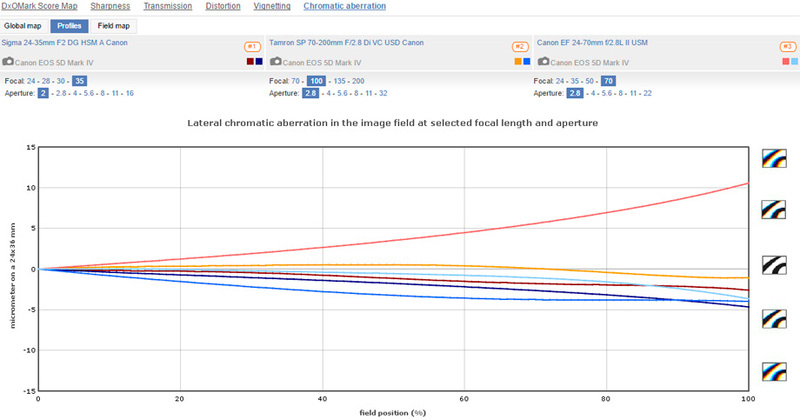 Tamron and Canon are neck-and-neck with their 24-70mm F2.8 models, only this time Canon loses by just a nose. It can’t compete on price with the Tamron, but the Canon has better sharpness in the outer field at wider apertures and lower barrel distortion. This said, it’s not without a few weaknesses compared to the cheaper Tamron: the Canon has slightly higher pincushion distortion mid-range and higher vignetting; moreover, it displays chromatic aberration throughout the focal range, even if it is better corrected at the shorter end. 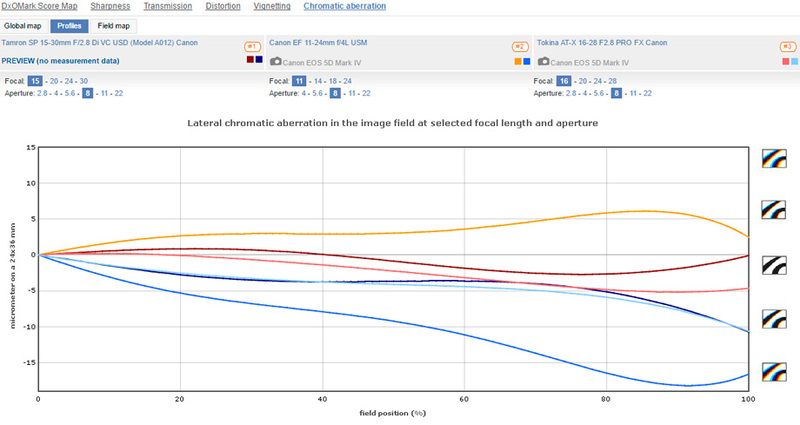 Although this is good performance for a zoom, it does not put the Canon ahead of the Tamron equivalent. High-speed telephotos are generally preferred for their image quality, but they’re large and expensive — and, naturally, lack the versatility of a telephoto zoom. 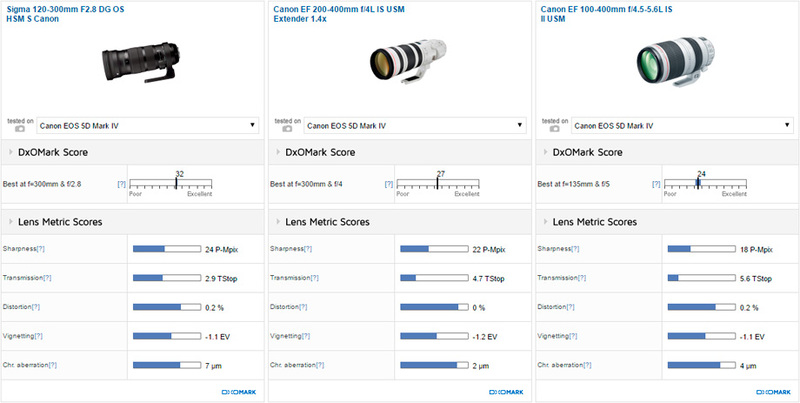 We’ve tested a total of 8 models with focal lengths between 100 and 600mm, and with DxOMark scores ranging from a high of 32 points for the high-end Sigma 120-300mm F2.8 DG OS HSM S to 18 points for the original Canon EF 100-400mm F4.5-5.6L IS USM. 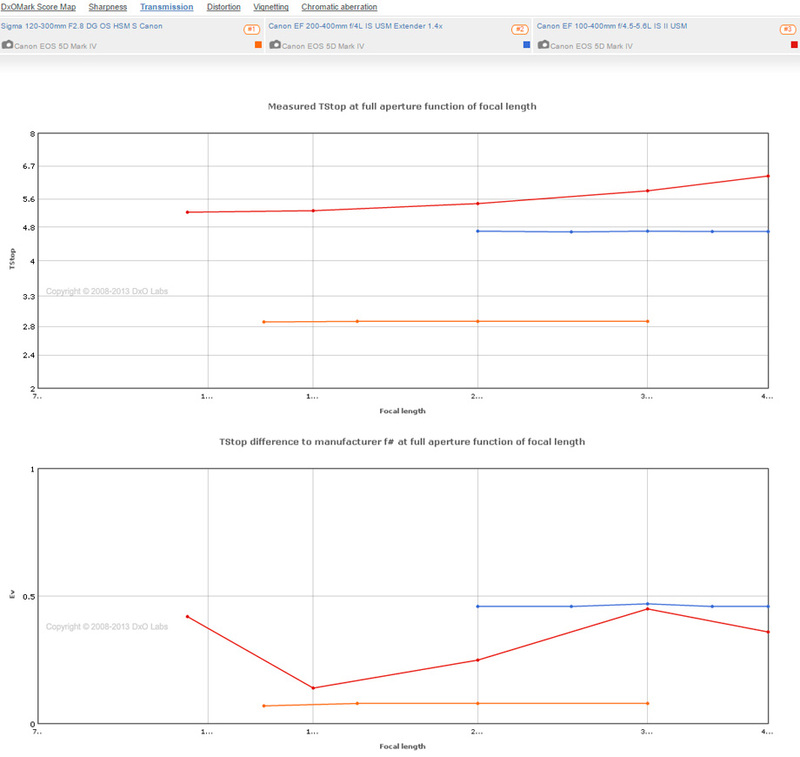 With an overall DxOMark lens score of 32 points, the Sigma 120-300mm F2.8 DG OS HSM S has the best balance of results of those tested. Considering its high-speed maximum aperture, it has low distortion and vignetting, excellent transmission of T2.9 throughout the focal range, and good control of lateral chromatic aberration. At around $3600, it’s not cheap, but it has very high sharpness levels that surpass even those of the second-place $11,800 Canon EF 200-400mm F4L IS USM Extender 1.4x. If money is no object, the Canon EF200-400mm F4 with its extra reach and built-in 1.4x extender (resulting in a total effective focal length and maximum aperture of 560mm at f/5.6) looks tempting. It has very good sharpness at every focal length; has extraordinarily low levels of chromatic aberration (especially given that it’s a zoom); no distortion; low vignetting; and has consistent transmission of T4.7, just under half a stop from the full aperture. In third place is the smaller, lighter, and much more reasonably-priced ($2,200) Canon EF 100-400mm F4.5-5.6L IS II USM. This recently-updated lens is optically excellent — sharp throughout the focal lengths even when wide-open, with barely any lateral chromatic aberration. It has similar measured levels of vignetting (albeit slightly more noticeable at 400mm than its sibling), and relatively low distortion.